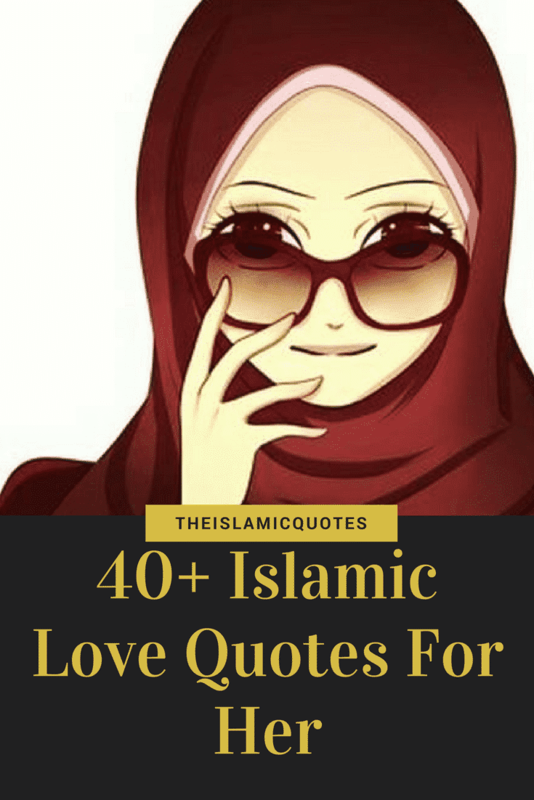 Islamic Love Quotes For Him. 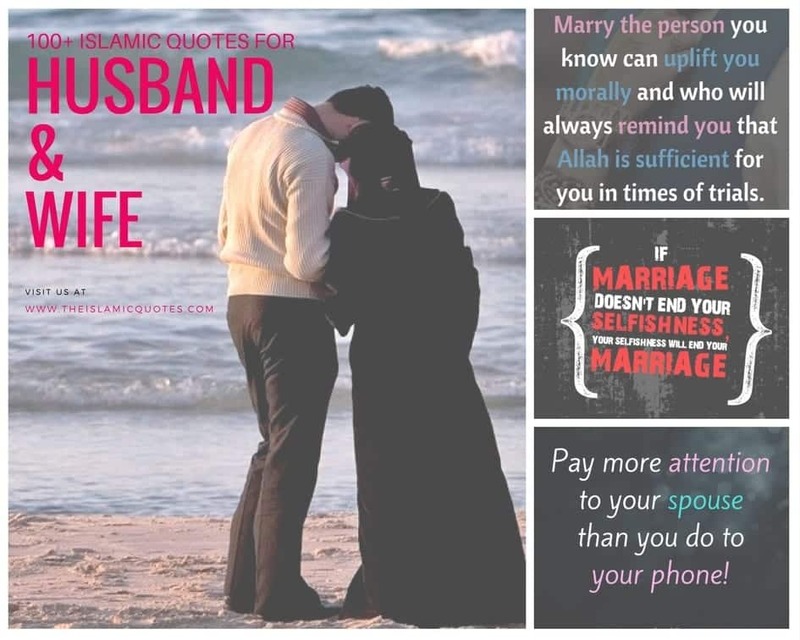 Muslim couples are taught to love each other all the time. 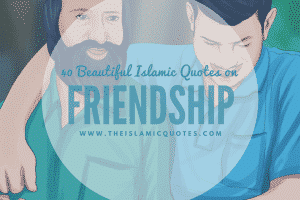 When they look each other with love, it pleases Allah and He looks at them with mercy. 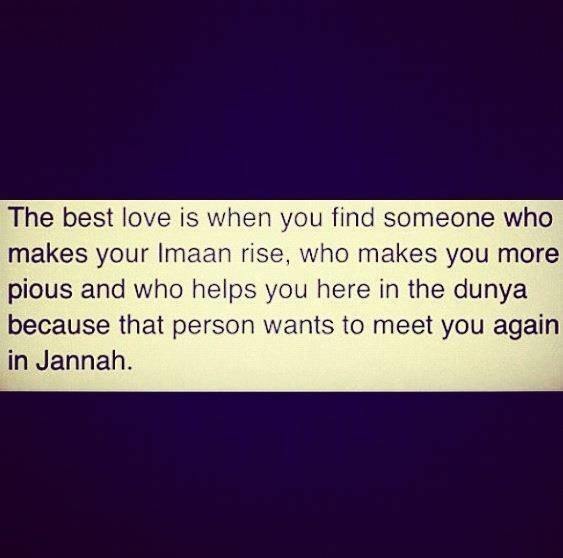 The spouse love is the best love because it increases their faith and complete their half deen. Among His signs is that He created for you mates from among yourselves, in order to have tranquility with them and He put love and mercy between your (hearts): verily in that are signs for those who reflect. 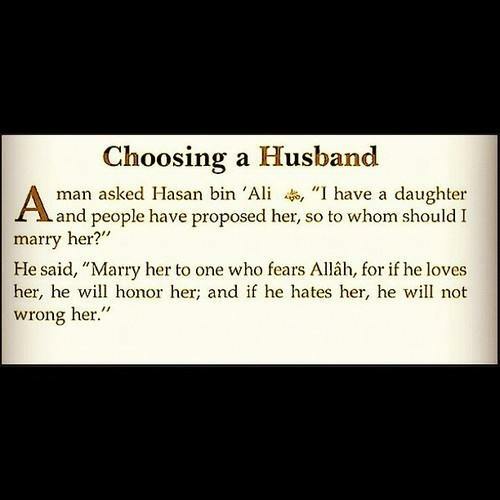 Wife’s love for her husband is like a sacred bond. This love grows stronger with the time as Allah had sealed their fates with each other before they were born. Their true love and compassion is purely for the sake of Allah. 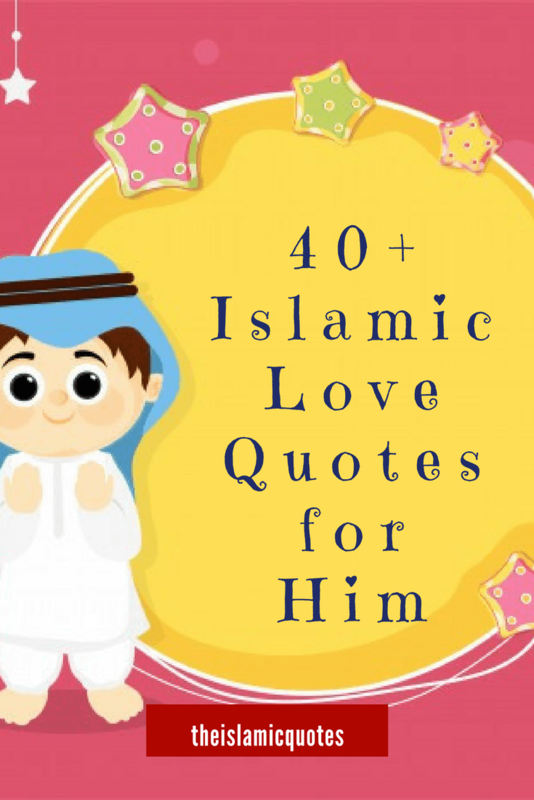 We have published some quotes for him/husband to show your feelings and hidden love for him. 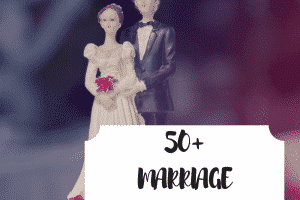 ↓ 40- Ya Allah, Take special care of my Husband, bless his mind and heart, strength is body and soul and make easy for him the path you wish for him to follow. 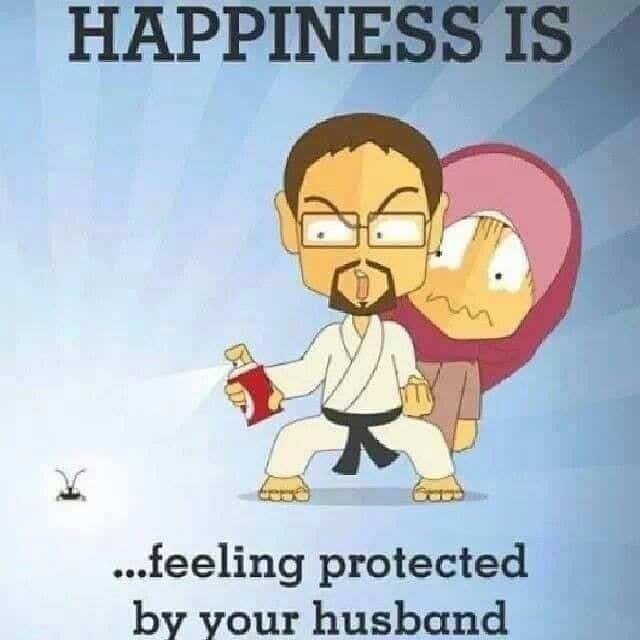 ↓ 39- Happiness is feeling protected by your husband. 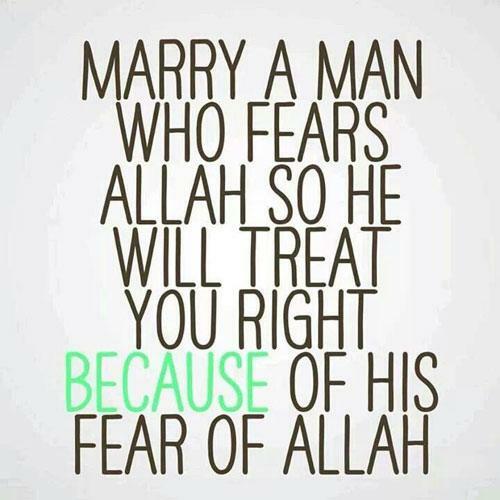 ↓ 38- Marry a man who fears of Allah, so he will treat you right because of is fear of Allah. ↓ 37- I don’t need a ring. 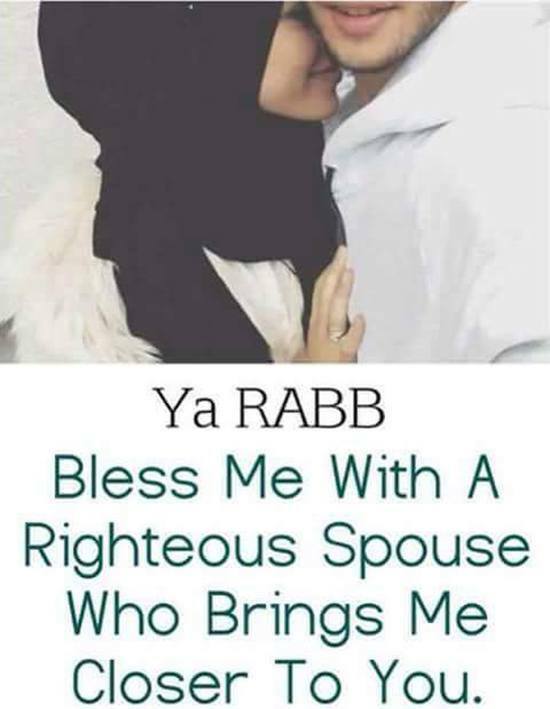 I need his deen. 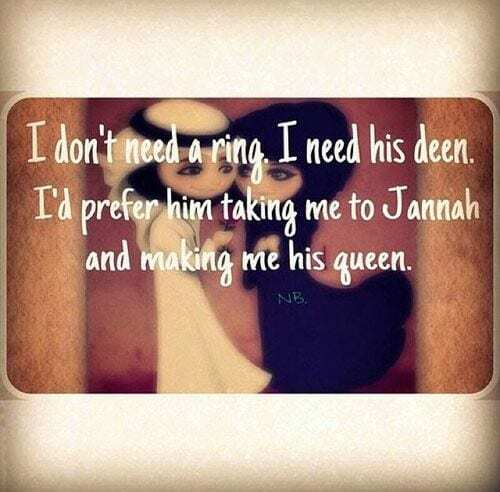 I’d prefer him taking me to Jannah and making me his queen. ↓ 36- I do have a boyfriend. I call him my Husband. 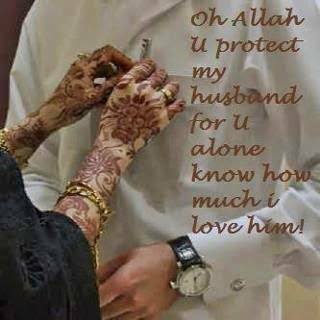 ↓ 35- Oh Allah you protect my husband for you alone know how much i love him. 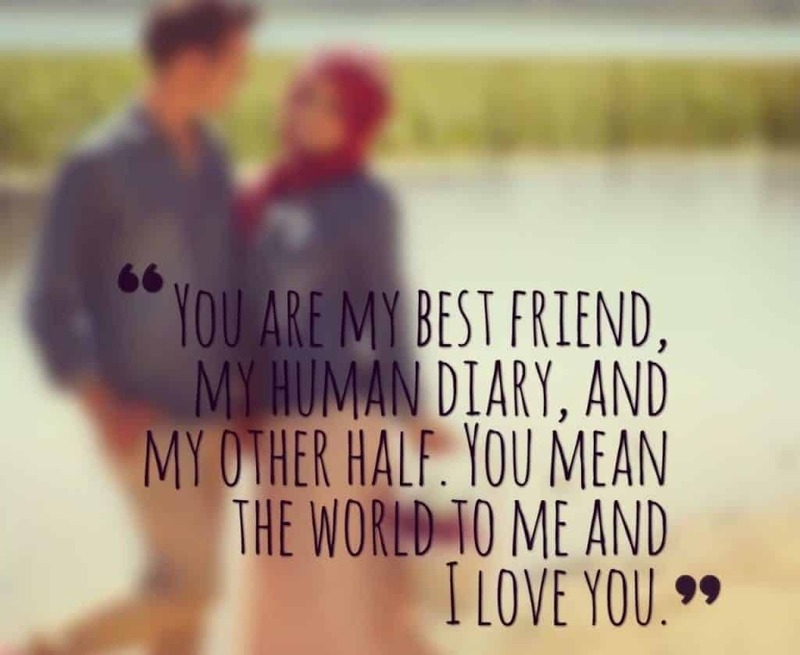 ↓ 34- You are my Best friend, my human diary and my other half. You mean the world to me and i love you. ↓ 33- It’s forever you and me Insha Allah. 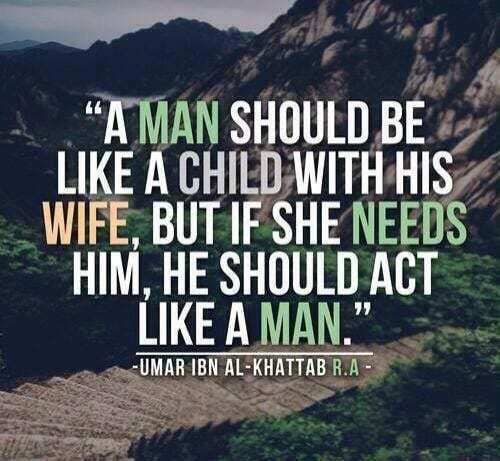 ↓ 32- A real man will offer you, Marriage. 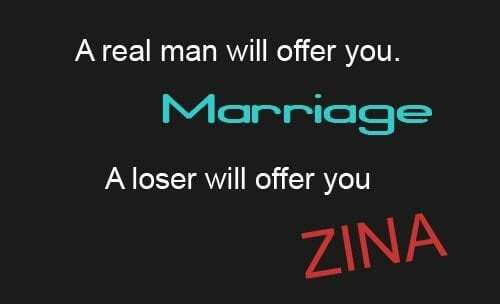 A loser will offer you Zina. 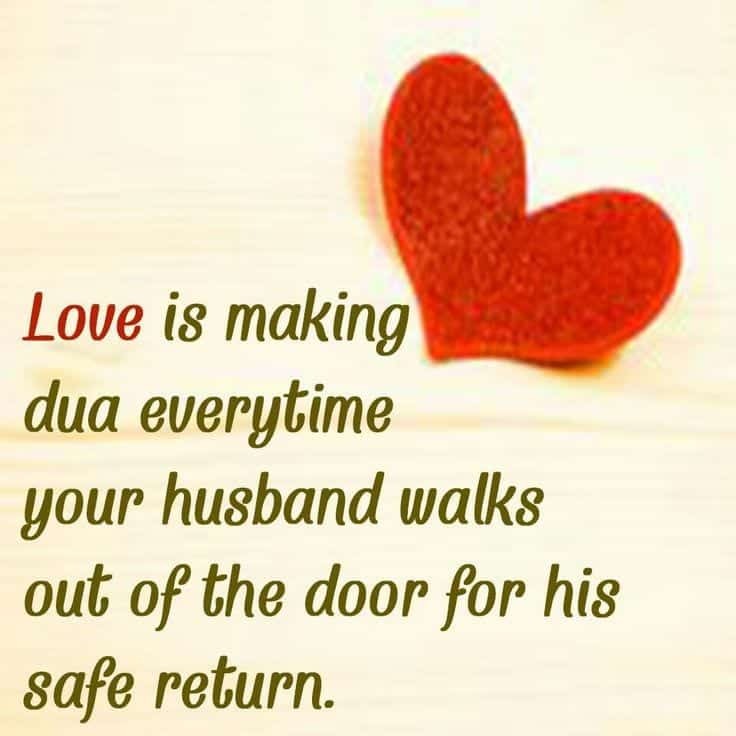 ↓ 31-Love is making dua every time for your husband walks out of the door for his safe return. ↓ 30- Ya Allah grant me someone who will Hold my hand to Jannah. 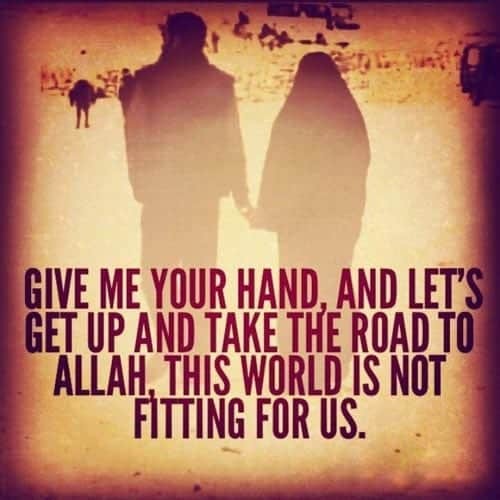 ↓ 29- Give me your hand and let’s get up and take the road to Allah. This world is not fitting for us. ↓ 28- Do you want a man dancing behind you in the club? 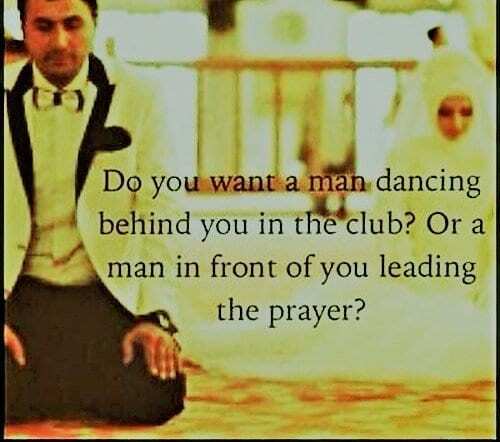 Or a man in front of you leading the prayer? 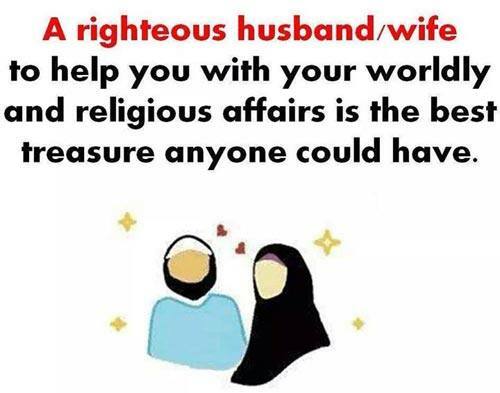 ↓ 27- A righteous husband/wife to help you with your worldly and religious affairs is the best treasure anyone could have. 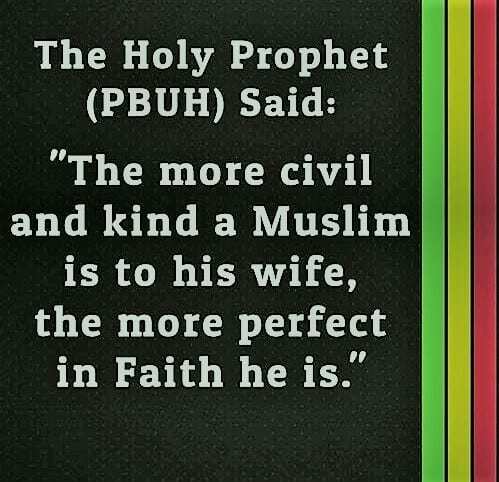 ↓ 25- The Holy Prophet PBUH said; The more civil and kind a Muslim is to his wife, the more perfect in faith he is. ↓ 24- I want love that will say; Not even death will do us part because we’ll be reunited in Jannah. Insha ALLAH. 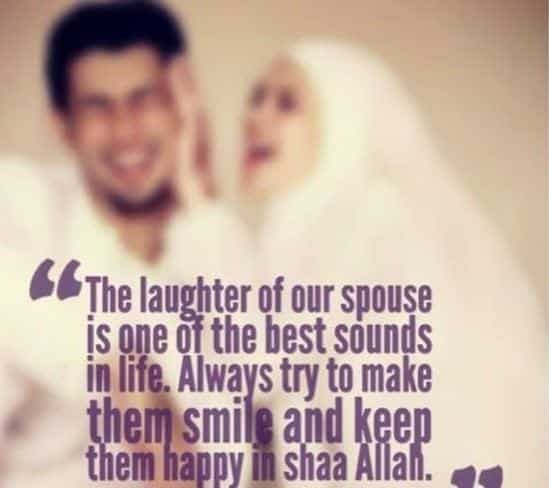 ↓ 23- The laughter of our spouse in one of the best sounds in life. Always try to make them smile and keep them happy Insha Allah. 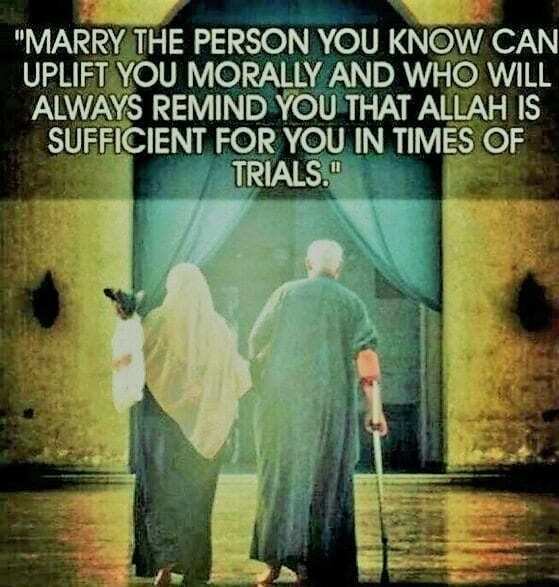 ↓ 22-Ya Rab Bless me with a Righteous Spouse who brings me closer to you. 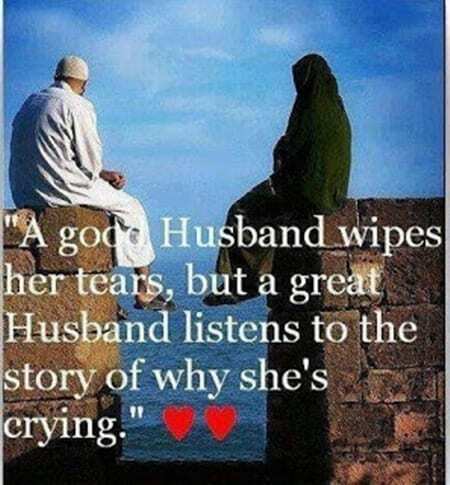 ↓ 21- A good Husband wipes her tears nut a great husband listen to the story of why she’s crying. 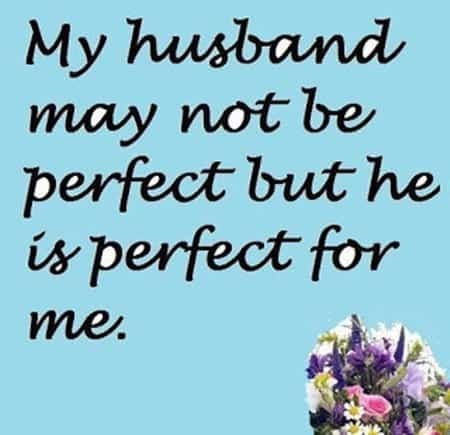 ↓ 20- My husband may not be perfect but he is perfect for me. 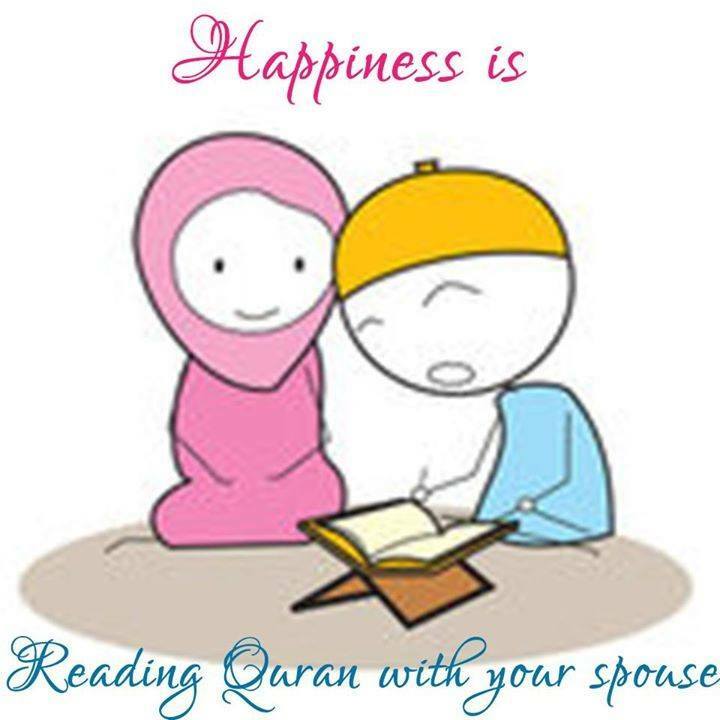 ↓ 19- Happiness is reading Quraan with your spouse. 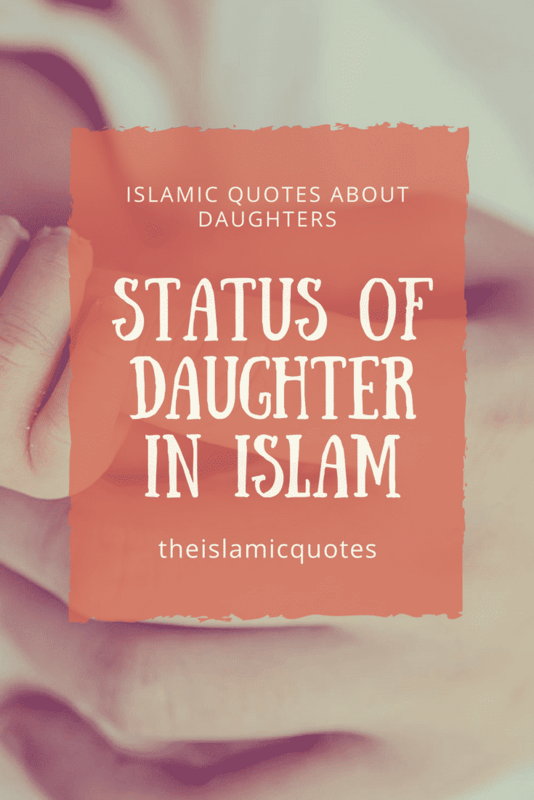 ↓ 18- The best love is when you find someone who makes your Imaan rise, who makes you more Imaan rise, who makes you ore pious and who helps you here in Dunya because that person wants to meet you again in Jannah. ↓ 17- He’s praying for her. She’s praying for him. 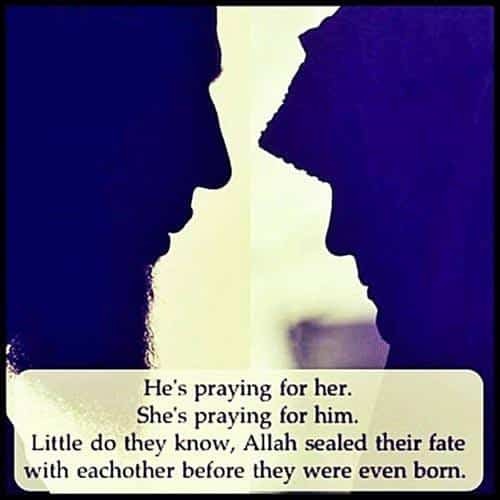 Little do they know Allah sealed their fate for each other before they were born. 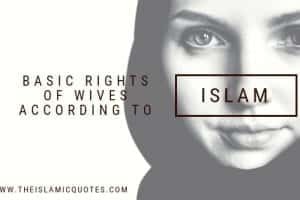 ↓ 16- I love my husband for the sake of Allah. ↓ 15- to my future Husband; I am praying for you and i am excited to pray with you for the rest of the days. 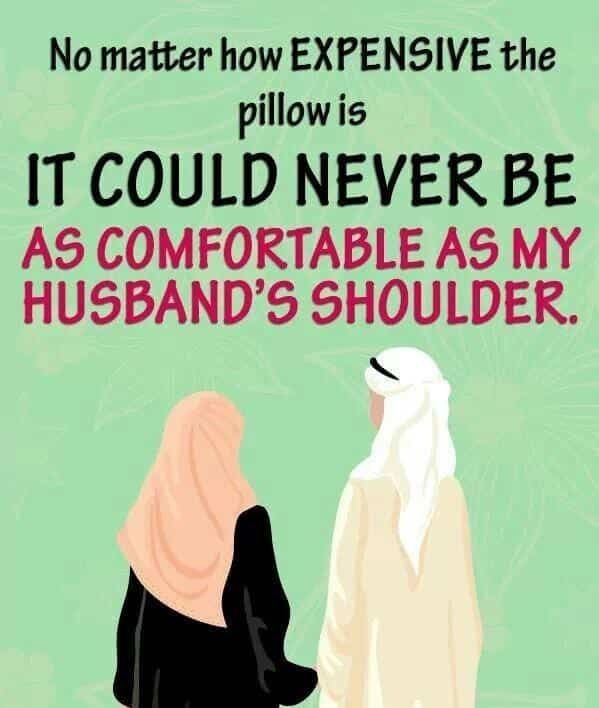 ↓ 14- No matter how expensive the pillow is it could never be comfortable as my husband’s shoulder. ↓ 13-When a husband and wife learn deen together they find love and beauty in each other. 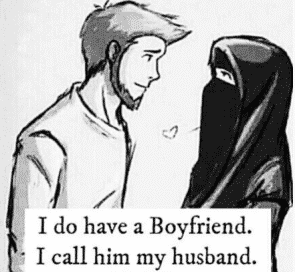 ↓ 12- Dear Husband, thank you for completing half my deen. 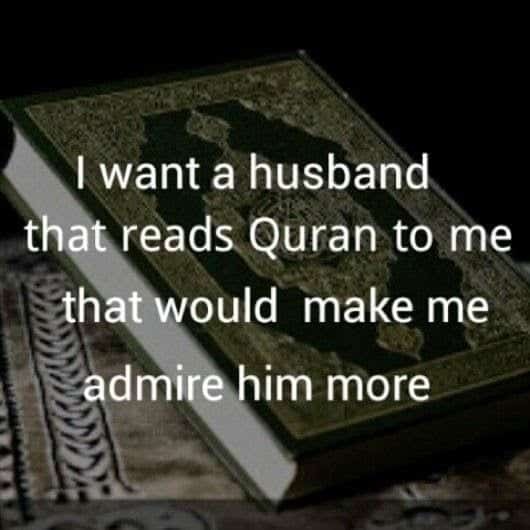 ↓ 10- I want a husband that reads Quran to me that would make me admire him more. ↓ 9- The female doesn’t want a rich man, a handsome man or even a poet. 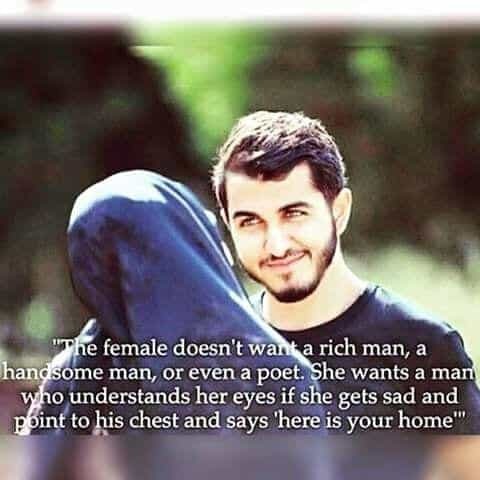 She wants a man who understands her eyes if she gets sad and point to his chest and say ‘here is your home’. 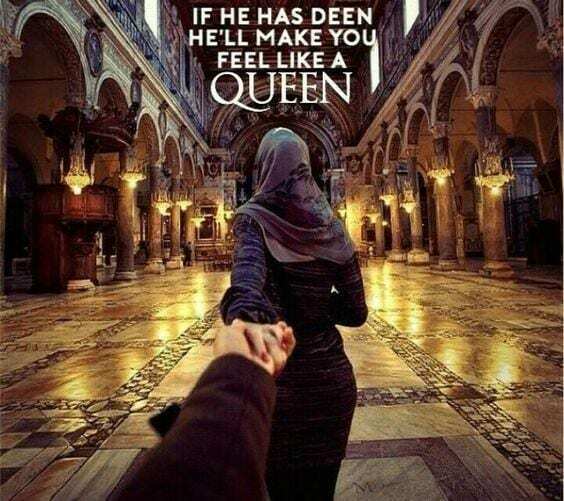 ↓ 8- If he has deen, he will make you feel like a queen. 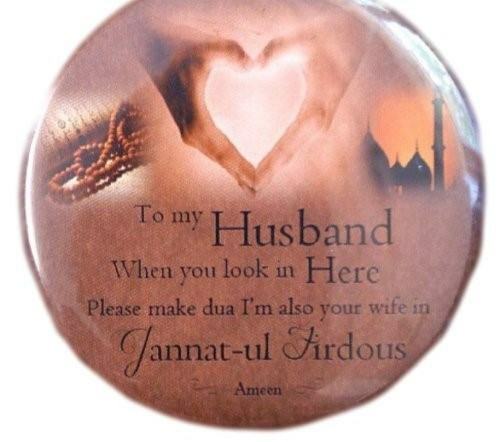 ↓ 7- To my Husband, When you look in here Please make dua i’m also your wife in Jannat-tul Firdous, Ameen. 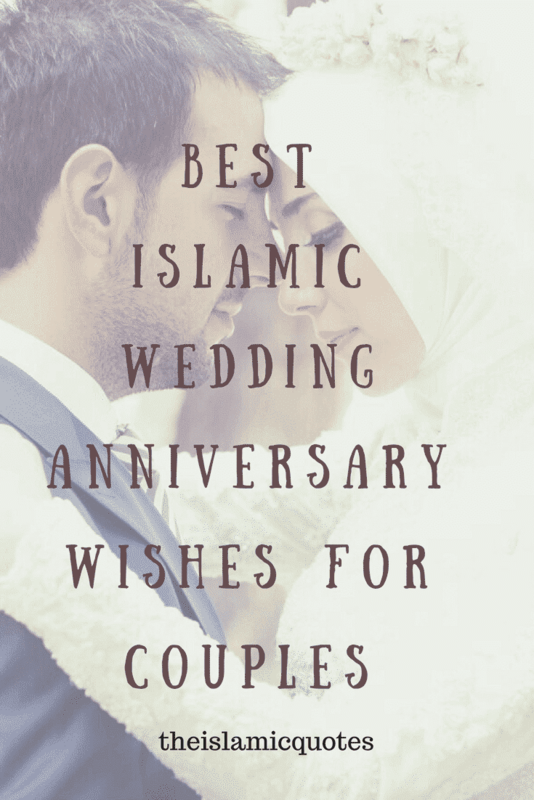 ↓ 6- Marry the person you know can uplift you morally and who will always remind you that Allah is sufficient for you in times of trials. 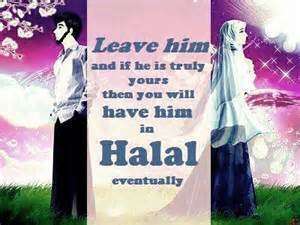 ↓ 5- Leave him if he is truly yours then you will have him in Halal eventually. 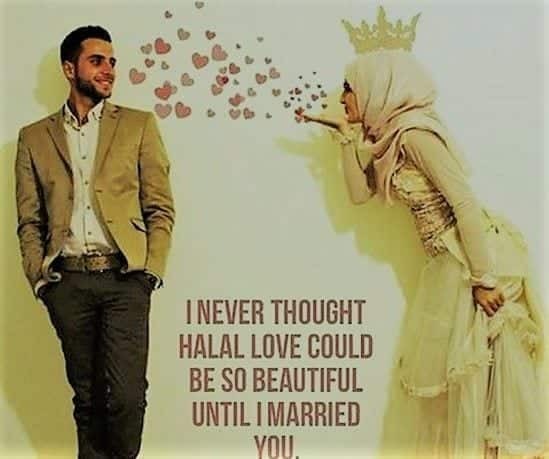 ↓ 4- I never thought Halal love could be so beautiful until i married you. 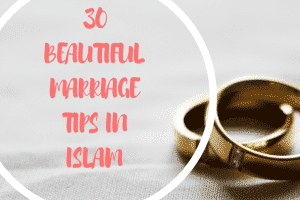 ↓ 3- It is the duty of the Muslim husband to be religiously educated and to see that his wife also receives a religious education. 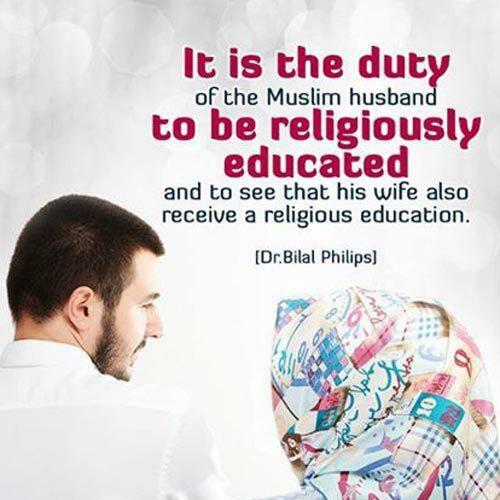 Dr. Bilal Philips. 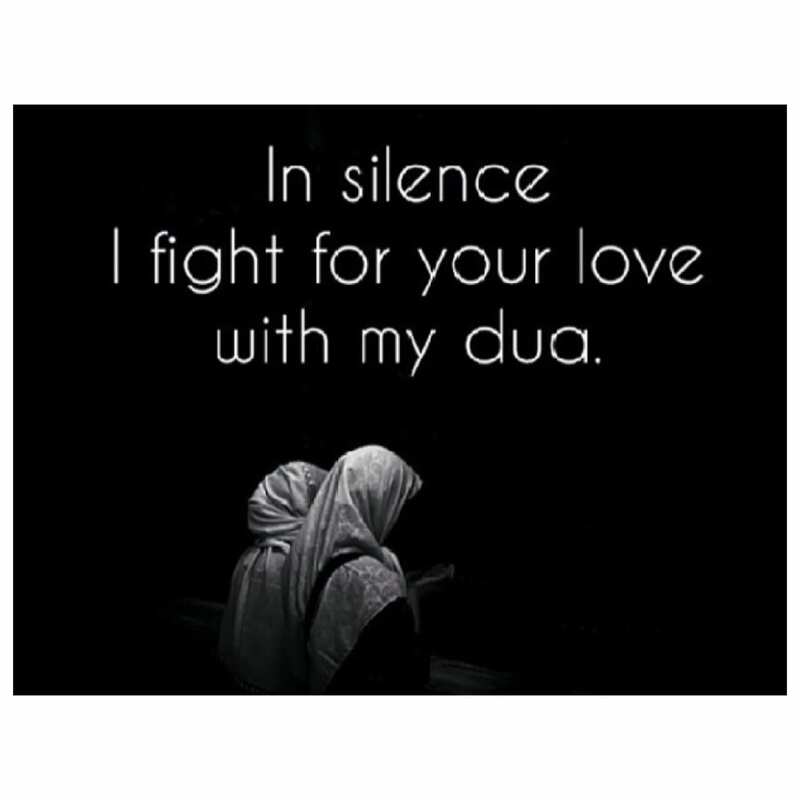 ↓ 2- In silence i fought for your love with my dua. 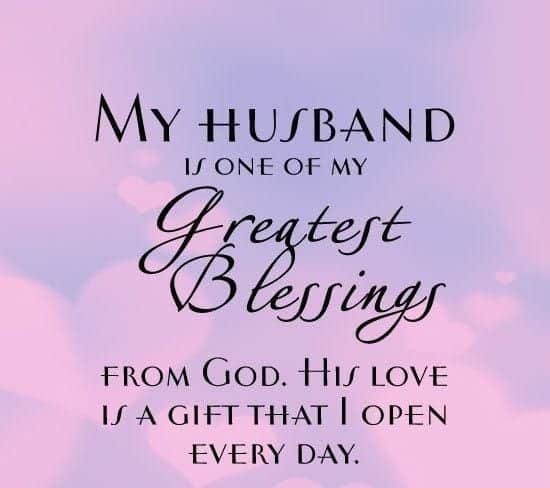 ↓ 1- My Husband is one of my greatest blessings from God. His love is a gift that i open everyday.